I am working as a sub contractor fitting the new housing develpoment in Hampton Gardens in Balbriggan County Dublin. 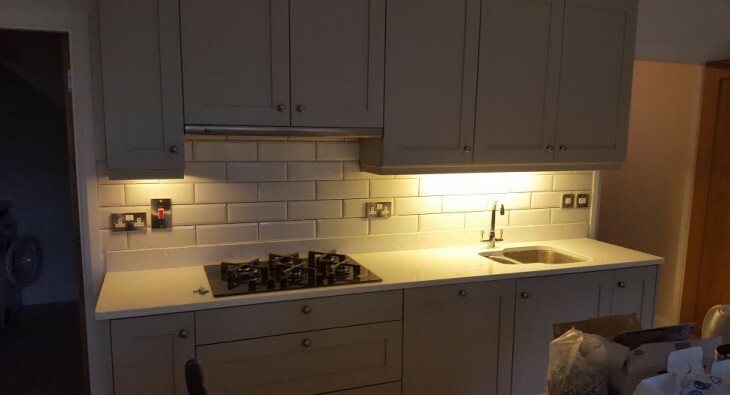 I am a kitchen contractor Dublin that can supply and fit the kitchens, wardrobes and any other cabinetry in housing developments in Dublin and surrounding counties. 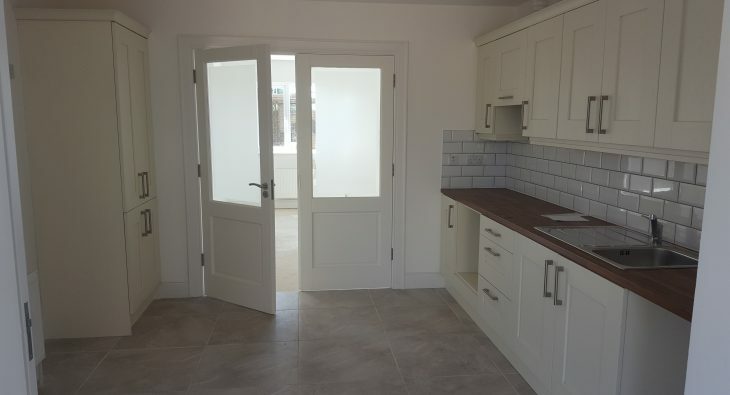 The work consists of fitting the kitchen, fixed and sliding wardrobes in each of the new houses in the development. The base kitchen units are made up of a 1000mm base unit, 600 drawer pack, oven base unit and 450mm base unit. There is also 2 900mm wall units a 450mm, 400mm wall units and a. 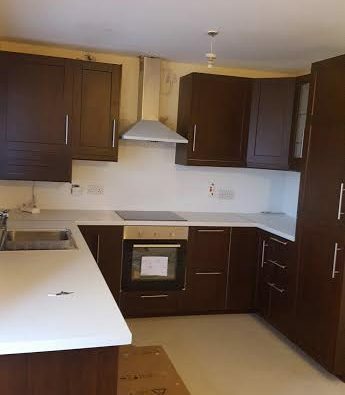 Dark Walnut new fitted kitchen Tyrellstown Dublin. 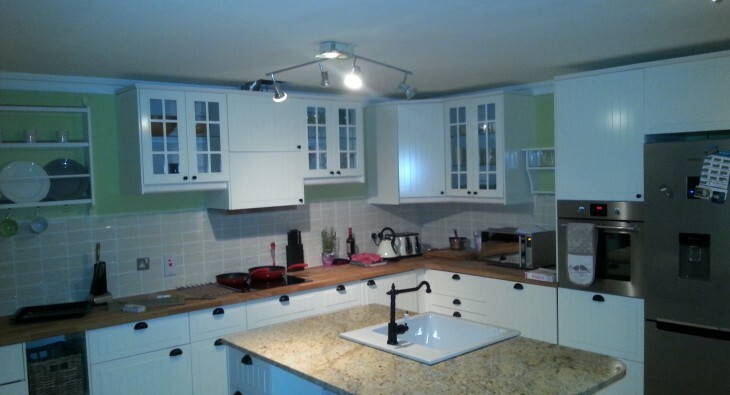 I fitted the Kitchenette just before Christmas Just off the south circular road Dublin. It is only a small kitchen but makes good use of the limited space available. It has a dishwasher, Belfast sink, oven, hob, extractor and drawer space and larder for all the essential kitchen items. They also have a pine island unit which they had from their previous house as this was a full house renovation. I fitted The new kitchen in Greystones Wicklow. I like the style of the doors as it reminds me of wardrobe doors i fitted a while back and taught they would be good in a kitchen and by the way this looks they would of. 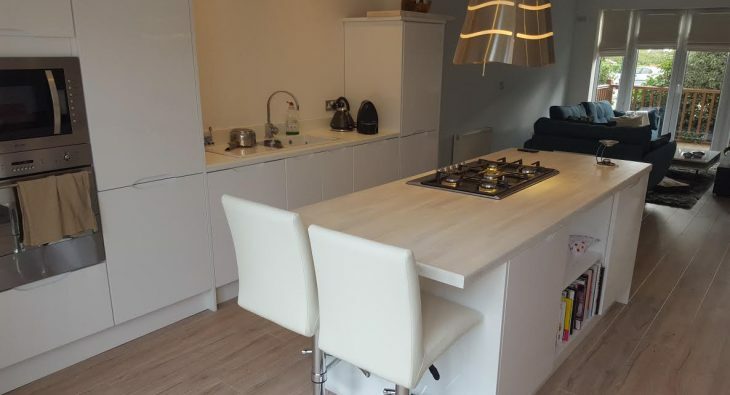 The solid Oak wokktop compliments the white doors and well as the Belfast sink which i love. The Smeg fridge freezer and aga oven also fits nicely into what the client wanted to achieve with the design. 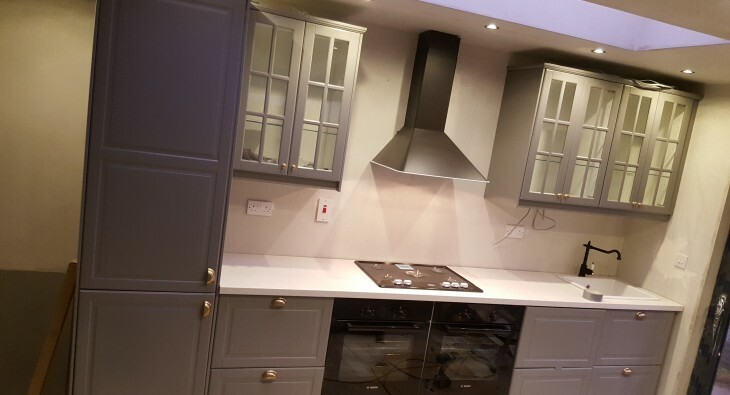 I contacted the client and Gillian wanted to match the colour of the new units to a existing Farrow and Ball colour that the Rathmines kitchen Dublin was already painted. The job consisted of making a tall larder unit with shelving inside, a wine rack and a 2.6m long 36mm shelf with corbels for the shelf to rest on. The shelf sits nicely over the granite ledge for the fireplace. The American fridge sits snuggly between the blends and the water for the fridge is stored in the tall unit which was the main reason for the job getting done. 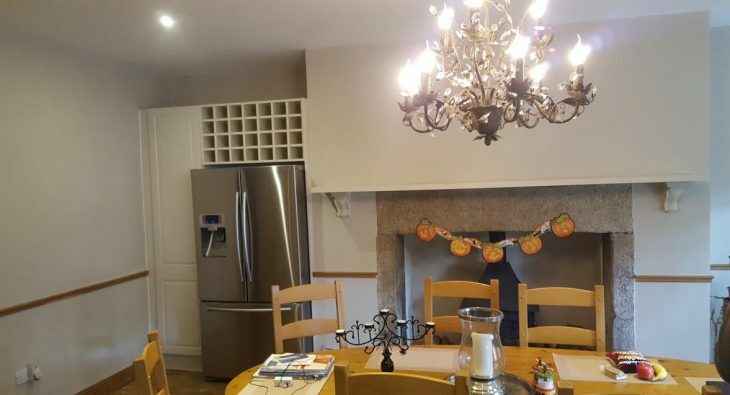 This Eden gate house got a downstairs renovation and fitted kitchen Delgany July 2016. There was originally 2 rooms with limited natural light throughout the day. The kitchen was in the front of the house with the living room at the rear. This was swapped. 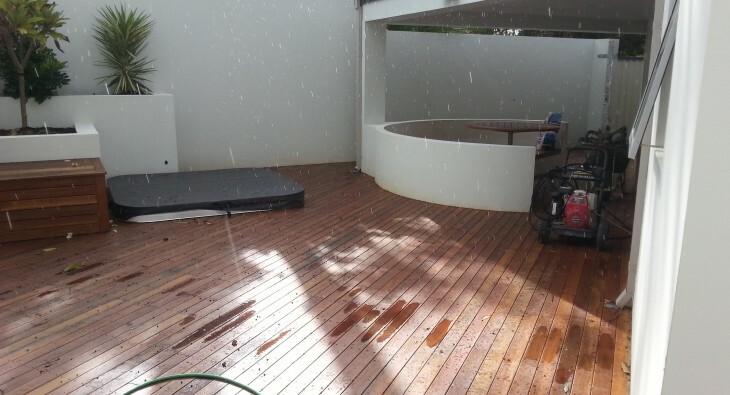 The partition was taken out to allow light to flow though the whole downstairs of the house. First job was to take up the tiles and flooring. The cables and plumbing were ran through the walls, ceiling and ground for the island. The patching and plastering could now start getting ready for a fresh coat. This white kitchen granite island worktop, with the glass wall unit doors was fitted in Enniskerry in December 2015. I ripped out existing kitchen which was outdated. 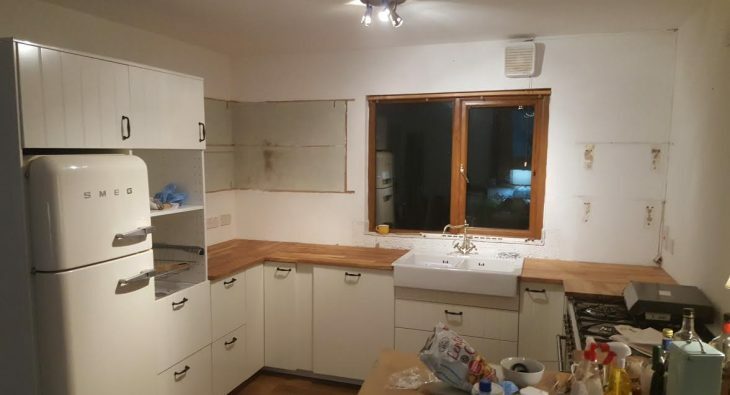 That kitchen was from the 1980’s so the new owners were keen to take it out. There was also underfloor heating which the new owners weren’t keen on so that came up to. A trench was dug for the island waste and electrics along with pipes for new radiators. The floor was then filled in and leveled once all connections were tested. Tiling was next. The tiles were 600mm x 600mm porcelain tiles.